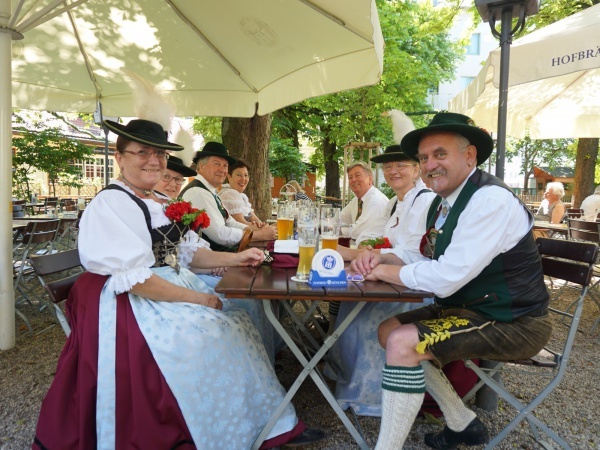 The Alter Wirt Moosach beer garden is a very nice and traditional beer garden located in the Munich city district of Moosach. The history of the Alter Wirt dates back to the 15th century. On the 12th March 1442, the Alter Wirt was mentioned in a document for the first time. In those days it was described as a "Täfernhaus", which refers to an inn offering food, drinks and accommodation. The Alter Wirt Moosach is one of Munich's oldest restaurants. The beer garden is equally divided into a self-service and served area. The self-service area has about 40 traditional beer garden benches with space of minimum 400 guests. All benches stand in the shade of large and smaller chestnut trees. 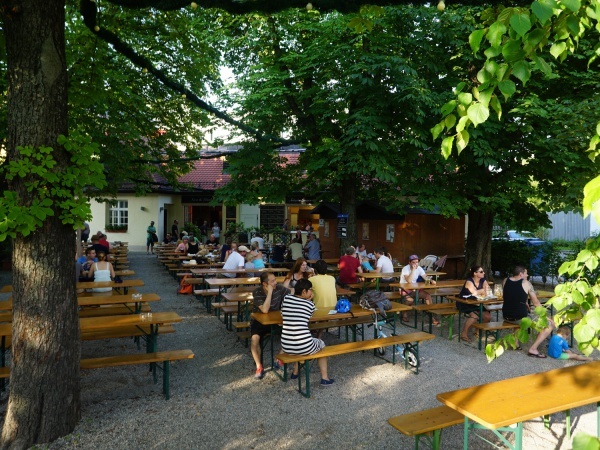 A sign at the entrance of the beer garden states clearly that according to the Bavarian beer garden regulation it is allowed to bring an own Brotzeit (light meal). For those who don't want to pack their own stuff together at home can choose from the various beer garden meals at the food stall, which offers among others Obatzda (Bavarian cheese spread), spareribs, sausage salad, sandwiches, salad and grilled sausages. All meals are freshly prepared at the time of the order. An electronic beeper is handed to guests to inform them when the order is ready. Explaining the functioning of this device to first time guests can sometimes be a bit time consuming, but the quality of the meals compensates for the extra waiting time in the queue. The beer comes from Hofbräu and a Maß Hell (lager) costs € 7.80 (May 2017). A special freezer ensures ice-cold glasses on very hot days. A plus of the beer garden is its very friendly and attentive staff. A minus is the noisy street in front of the beer garden which is mostly noticeable on weekdays throughout rush hours. The beer garden is open daily between 4pm and 11pm throughout the beer garden season and when the weather is good.